"Blogging" means "plumbing repair procrastination" in some primitive languages. My lavatory faucet needs to be replaced. Besides being ugly and lime-encrusted, which I'm used to, it is dripping waaaaaaayyy too much. Bought the replacement faucet at Home Depot. I know I can do the job if I say the right primitive incantations, but it is too daunting after a day at work. Plumbing is the tune of the day. 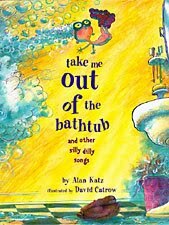 I couldn't help myself, and broke into song reading Alan Katz title poem in the picture book Take Me Out of the Bathtub right in front of innocent children. I'm usually so self-conscious about my tone-deafness, that I lip-sync "Happy Birthday To You", but the silly song versions broke past my inhibitions. The children couldn't stop singing "Take Me Out of the Bathtub" the rest of the afternoon. I tried looking it up*, but I can't find it. 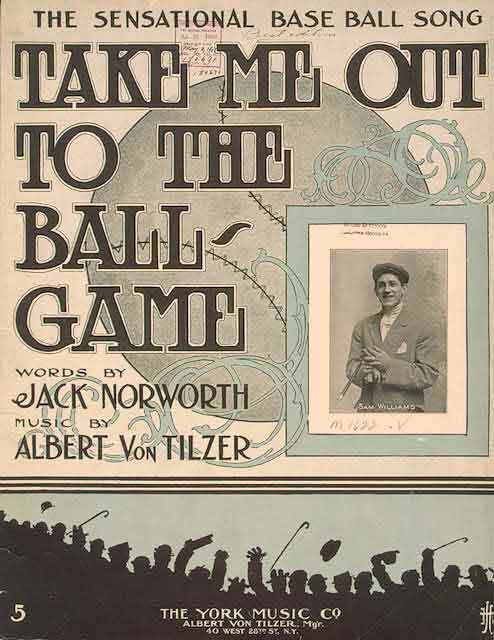 I'm sure I read statistics that the song known by the most people in the U.S. is "Take Me Out To the Ballgame", with "I've Been Working On the Railroad" second, ahead of "Happy Birthday", "Twinkle-Twinkle", and our national anthem. The report suggested if you ever had to lead a sing-along to keep people from panicking in an emergency situation, you had better lead off with the seventh inning stretch song. I find this useful information, and if I ever again have to bravely lead a group of children away from a barf scene to prevent copycat up-chucking, I will burst into baseball song. *In 1941 Thurber published a story titled "You Could Look It Up," in The Saturday Evening Post. It dealt with a baseball manager who in the course of a tight game sent a midget up to the plate because his strike zone would be so small that the opposing pitcher couldn't help walking him. After the count had reached three balls and no strikes the pitcher, desperately trying to get the ball over the plate, threw such a fat pitch that the midget couldn't resist swinging at it. The ball dribbled a few feet, and the midget was thrown out. The story ended with the manager's setting a new record for throwing a midget. And thanks to my boss for wondering aloud about the history of the baseball song. 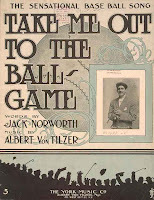 Jack Norworth wrote the lyrics in 1908.